This research presents a two-stage stochastic programming model that is used to design and manage a biomass co-firing supply chain network under feedstock supply uncertainty. The model we propose extends current models by taking congestion effects into account. A non-linear cost term is added in the objective function representing the congestion factor which increases exponentially as flow of biomass approaches the capacity of multi-modal facility. We first linearize the model and then use a nested decomposition algorithm to obtain a feasible solution in a reasonable amount of time. The nested decomposition algorithm that we propose combine constraint Generation algorithm with a sample average approximation and Progressive Hedging (PH) algorithm. We apply some heuristics such as rolling horizon algorithm and variable fixing technique to enhance the performance of the PH algorithm. We develop a case study using data from the states of Mississippi and Alabama and use those regions to test and validate the performance of the proposed algorithm. Numerical experiments show that the proposed algorithm can solve large-scale problems with a larger number of scenarios and time periods to a near optimal solution in a reasonable amount of time. Results obtained from the experiments reveal that the delivery cost increases and less hubs with higher capacity are selected if we take congestion cost into account. Association of American Railroads. (2005). National rail infrastructure capacity and investment study. Available from: http://ops.fhwa.dot.gov/freight/freight_analysis/freight_story/congestion.htm. Bioenergy Knowledge Discovery Framework (KDF). (2013). Available from: https://bioenergykdf.net/taxonomy/term/1036. General Algebraic Modeling System (GAMS). (2013). Available from: http://www.gams.com/. Hubbard, R. (2014). Bnsf railway to put $6 billion toward relieving congestion. Available from: http://www.omaha.com/money/bnsf-railway-to-put-billion-toward-relieving-congestion/article_f00f7b1d-353e-58e3-abd5-3967d8f2c474.html. Marufuzzaman, M., & Ekşioğlu, S. D. (2016). 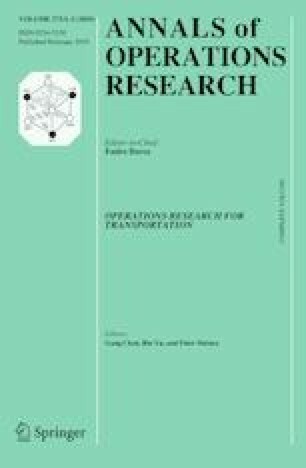 Designing a reliable and dynamic multimodal transportation network for biofuel supply chains. Transportation Science. doi: 10.1287/trsc.2015.0632. Parker, N., Tittmann, P., Hart, Q., Lay, M., Cunningham, J., Jenkins, B., & Schmidt, A. (2008). Strategic assessment of bioenergy development in the west spatial analysis and supply curve development. Final report. University of California, Davis. http://www.westgov.org/component/docman/doc_download/215-wgabioenergy-assessment-spatial-analysis?Itemid=. The National Energy Technology Laboratory. (2005). Coal-fired power plants in the United States. Available from: http://www.netl.doe.gov/energyanalyses/hold/technology.html. United States Energy Information Administration. (2014). State energy data system (seds): 2012 (updates). Available from: http://www.eia.gov/state/seds/seds-data-fuel.cfm?sid=US. Williams, J. L. (2007). Information theoretic sensor management. Available from: http://dspace.mit.edu/handle/1721.1/38534.